So I know its been awhile since I blogged but I am back in 2017! 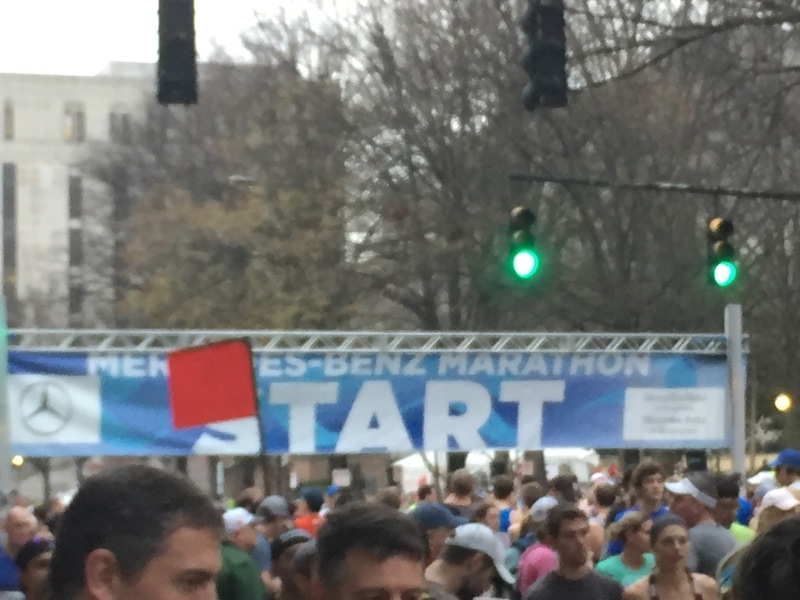 This past weekend I ran the Mercedes-Benz half marathon. It was a C race and more so because mom and I needed to check off the State of Alabama from our list. This was also my first race in my new age category, so that was weird for me. Anyways to start, this race was ranked as one of the best ones to complete in the state of Alabama. I am going to say that, if this is the best, the others concern me. This race was not very good. The expo was minimal, the race route had some ugly parts of town, and overall I was not impressed. The medal has not changed (see below), but I will say that the course support was excellent. They know how to prepare for a hot day, and it was lovely seeing people out on the course cheering you on, in the popular parts of town. The neighborhoods… not so much. The race had plenty of water, GU, and Powerade, but I guess that makes sense as the marathon is double race route. Yes, that means you have to complete it twice. We stayed at the Sheraton in downtown Birmingham for the race. A great location proximity wise to the start/finish line and provides free shuttle services to and from the airport. It is also located next to Uptown, an area with multiple restaurants perfect for pre and post fueling. The race began at 7:03 am with the announcer yelling go. The course then took you on a loop around the downtown city, then up to the outskirts and local neighborhoods. Numerous rolling hills made up the entire course. The post race was probably the best with the amount of food available (not suitable for vegetarians FYI), but they provided you with goody bags to take with you. Overall, I was not a fan of this race, town or course and I recommend researching other races in the state. Perks: Hotel location, start/finish line in the same spot, post race food to go bag, good job with the number of aid stations.